Crochet Pattern by B. Hooked Crochet, Copyright 2013.
c) For next stitch, insert hook into the “circle” at the centre of the star created by the last chain stitch (it’s right next to the loop on your hook) and draw up a loop (now 2 loops), insert hook just below, into the “gap” that that appears immediately to the left of the star stitch just made and draw up a loop (now 3 loops on hook), draw up a loop in each of next 2 stitches, (again under top/front single loop only), (till 5 loops on hook), draw up a loop and pull through all 5 loops on hook, chain one st to lock**; repeat from * to ** to end of row; then wool round hook and insert hook again into last stitch, draw up a loop, wool round hook again and pull through all 3 loops (one hdc made) to finish this row. Total of 21 star stitches made with on hdc at end. 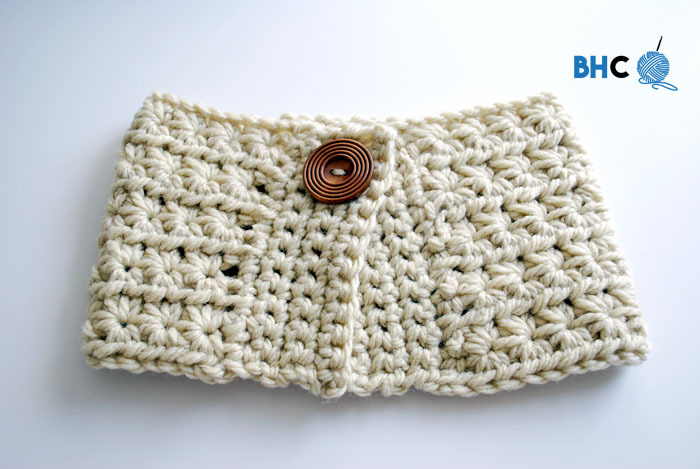 b) Insert hook into circle of last stitch and draw up loop, insert hook into gap of previous stitch, as before, and draw up loop, insert hook and draw up loop in next 2 stitches (under both top loops) (5 loops), draw loop through all 5 loops, chain 1 to lock. Carry on with star stitches to end of row as per Row 1. Hdc in last stitch to finish row. Star stitch rows should be starting to stack up evenly aligned with each other. Repeat Rows 3 and 2 till desired height is reached, ending with a Row 2. (I repeated 3 more times for 5 complete sets of star stitches (10 rows total)). Chain one, pull tight, cut yarn and pull through to secure. When finished edging, chain one, pull tight, cut yarn and pull through to secure. Repeat for other side, or make buttonhole edge as below. 1) Repeat Row 1 of buttoned edge, joining yarn in first corner made, at bottom of right front edge. 2) Ch 1, turn. Sc in each sc back down edge to end. 3) Ch1, turn. Sc in each sc to last 4 stitches, ch2, skip 2, sc in remaining sc to end. 4) Ch 1, turn. Sc into each stitch across, including the 2 chain stitches of buttonhole in previous row. 5) Ch 1, turn. Sc into each stitch across. Repeat till same width as button edge. Chain one, pull tight, cut yarn and pull through to secure. Cut a sewing length of yarn, and split the yarn into single ply to use for sewing. Sew button in place (using backing button as “gasket,” if necessary to prevent any possible “pull-‑through”). Overlap edges and sew through both thicknesses (to go over head), or fix button to button edge as suggested. 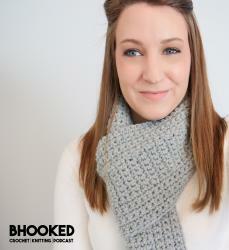 Original design by Brittany of B.Hooked Crochet; text compiled by Linda Nygaard, Vancouver Island, BC. I’ve had another request for a written pattern so I do plan on adding one in the near future. The problem I keep running into is how to explain where to insert your hook to draw up the loops so that it makes sense. You may have to supplement the written instructions with the video to see where I am inserting my hook! Love your posts and videos! Thank you! You’re welcome Rose, glad you’ve enjoyed them!